Welcome to my new series! 'Best of the Best' is about sharing my favourite blogs and bloggers. I'm not just going to be talking about the peoples blogs but them as people as well. For me personality is a big part of blogging, its nice to get to know the person behind the blog as well. 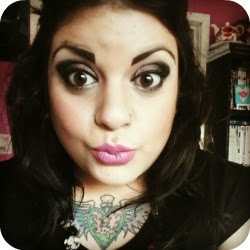 To kick off my series I'm starting with one of my favourite blogs/bloggers | Sophia from tattooedtealady.com. Whenever a post from Sophia pops up on my dashboard I'm there in a flash. I love reading her reviews as I really trust her opinion and she gets the balance of information and opinion just right. This might sound weird to some but I'm a lover of English Language and Sophia uses such a large range of vocabulary, this makes her posts sound more exciting and makes you want to go back for more! Its not just her reviews that I love reading as well. She's started doing lifestyle posts more often and has even started doing Charity of the Month posts. Like I've said before its nice to see people's favourite products etc but sometimes people forget that there is a person behind the blog so its nice to get to know a blogger a bit better. Sophia is always getting involved with the blogging community and makes everyone feel very welcome. She is always arranging meet up's, she is even arranging a London one despite the fact that she lives in Nottingham! She is very dedicated to her blog and this really shines through in her posts. Sophia really inspires me. She has very strong opinions and isn't afraid to share them or get involved in a good ol' debate. I wish I was more like this, I'd love to be more bold about my opinion on some things. She is also very down to earth, a quality I really admire in people. I know I will continue to love her blog and be inspired by her. Sophia's blog is by far one of my favourites and if you don't already follow her I suggest you take a look, you definitely won't regret it! If you already follow Sophia's blog (or decide to) leave her a lovely comment below about what you like most about her blog or go over to her blog and leave a comment there, its nice to share the love! Shes so lovely. A great person and I do like her personality. I like the fact that she shares her opinions which is what you really should do. I love her blog and she a great person to talk to as well. I need to check her out.